Powder fire extinguishers have been manufactured by PASTOR for more than 70 years. The fire extinguishers filled with multipurpose ABC powder agent enitrely meet all current domestic and European requirements in terms of design, manufacturing method, quality control and their technical characteristics. Powder-filled fire extinguishers are characterised by the simplicity of activation, as well as reliability and safety during handling. In accordance with the special requests from the buyers, powder-filled portable devices can be ordered in various models, including luxurious models. In terms of design, a distinction can be made between fire extinguishers under stored pressure (where gas is placed directly in the containers) and extinguishers with a cylinder (where gas is placed in a cylinder within the container). For extinguishing flammable metals (class D) only a special D-powder should be used, one with which our fire extinguishers are filled at special request. 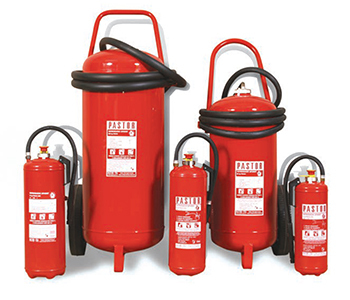 Such fire extinguishers, apart from the D-powder, are also fitted with a special nozzle used to quickly and efficiently put out fire on flammable class-D metals. The activation system using the im-pact button provides the fastest acti-vation without a possibility of wrong operation. The built-in CO2 cartridge ensures high reliability over a long period of time, whereas a stop-nozzle at the end of a flexible rubber hose is easy to handle and made for safe suppression of all fire classes. APPLICATION: Due to their reliability, we recommend using the fire extinguishers with CO2 cartridges in industrial plants and warehouses, residential premises, hotels, garages and means of transport.They can be successfully applied in fighting all classes of fire except for combusting metals and their alloys. 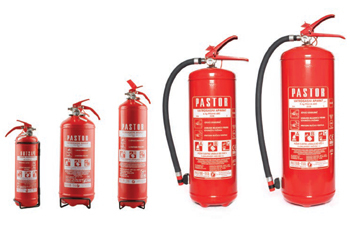 Fire extinguishers under stored pressure are manufactured by PASTOR as portable with filling capacity of 1, 2, 3 , 6, 9 and 12 kg. Owing to the container, which is under a stored pressure of nitrogen gas, and their simple design, these extinguishers are always ready for use. The built-in pressure gauge, which is supplied as a part of standard accessories, shows the status of the extinguisher at any time. APPLICATION: We recommend using the fire extinguishers under stored pressure for suppressing initial fires in vehicles and households, because of their small dimensions and weight. They can be successfully applied in fighting all classes of fire except for combusting metals and their alloys.